PhyPhox: Your smartphone is a mobile lab. (Gibt’s auch in deutscher Sprache.) This app was created at RWTH Aachen and is available for free for Android and iOS. You can download it here. They also have a YouTube channel with demo videos in English and German. This entry was posted in Physics, School and Education, Science on September 29, 2017 by Andrea. Letter to First Lady Melania Trump from Liz Phipps Soeiro, School Librarian, Cambridge, MA. This entry was posted in Around the World, Books and Reading, Politics, School and Education on September 28, 2017 by Andrea. André and I visited Lewis (& Harris) during our trip to Scotland this summer and happened upon the place where the Lewis Chessmen were found. I don’t play chess, but loved these figures. 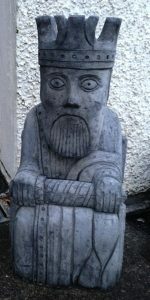 Our B&B on Lewis had resin replicas as decorative items on the breakfast tables, and we saw larger replicas carved from stone as doorstop or garden decorations. Unfortunately they were too heavy for our suitcase, or I would have bought one for our own garden. This entry was posted in Around the World, History on September 27, 2017 by Andrea. Medium: Why I Believe in Universal Healthcare. By Jenny Nicholson. “I was a junior in high school when my mother had her first heart attack. She was in her bed, moaning, crying that she couldn’t breathe. We were too poor to have a phone, so I ran barefoot to the neighbor’s house, 1/4 mile down the road. I’ve never moved so quickly in my life. This entry was posted in Around the World, Economics, Health, Politics on September 26, 2017 by Andrea. Update: If you prefer news about the German election, I recommend this MetaFilter thread: Upset in German federal election. n-tv: AfD: Was erwartet den Bundestag? “Die Nazi-Keule ist das Dümmste”. “Die deutschen Rechtspopulisten sind in einem Punkt auf jeden Fall ähnlich den anderen populistischen Parteien in Europa: Sie haben die Tendenz zur Selbstzerstörung durch mörderische Machtkämpfe an der Parteispitze. Beim “Front National” geht das sogar bis zur Ebene der Familie Le Pen. Nun hat die AfD-Co-Chefin, Frauke Petry, in Berlin ein Drama aufgeführt, was in die Annalen der Parteigeschichte eingehen wird. Als erste Partei am Tag nach der Wahl trat die AfD vor die Presse. Und zwar als Quartett aus den beiden Spitzenkandidaten des Wahlkampfs, Alice Weidel und Alexander Gauland, und den beiden Parteivorsitzenden Jörg Meuthen und Frauke Petry. Doch schon nach zehn Minuten platzte die Bombe. This entry was posted in Politics on September 25, 2017 by Andrea.